On multiple occasions throughout his campaign and after his election, President Donald Trump has talked about his plans to promote the expansion of “clean coal.” But it appears the industry has gotten a kickstart without him. The nation’s first large-scale “clean coal” facility—the largest of its kind in the world—was just completed and declared operational on Jan. 10. The Petra Nova project, a joint venture between NRG Energy, Inc. and JX Nippon Oil & Gas Exploration Corporation, is a coal-burning power plant located just outside of Houston. The “clean” part of its operation comes from its ability to capture some of its own carbon dioxide emissions, rather than emitting them into the air. While the plant was only just declared fully operational this month, it first began capturing emissions in September—and since then, it’s trapped more than 100,000 tons of carbon dioxide. According to an NRG news release, the plant is capable of capturing up to 5,000 tons of carbon dioxide per day, which is equivalent to removing about 350,000 cars from the road. For reference, the Environmental Protection Agency estimates that U.S. greenhouse gas emissions in 2014 totaled nearly 7 billion metric tons of carbon dioxide equivalents, which comes to around 19 million tons per day. Trump's new "America First Energy Plan" on the White House website states that his administration is "committed to clean coal technology, and to reviving America’s coal industry, which has been hurting for too long." The concept is relatively simple: CCS technology allows power plants or other industrial operations to trap their carbon emissions before they go into the atmosphere. The captured emissions can then either be stored in geological formations underground or used for industrial applications—most often for a process known as enhanced oil recovery, in which carbon dioxide is injected into the earth to help push more oil out of depleted oil reservoirs. Many experts have hailed the technology as a necessary future component of global climate efforts—both the International Energy Agency and the Intergovernmental Panel on Climate Change have recognized its potential as a mitigation strategy and a necessary step in the bridge from fossil fuels to zero-carbon energy sources like wind and solar. But in recent years, the technology has become the subject of bitter debate even among environmental groups, many of whom argue that resources would be better devoted to the continued expansion of renewable energy. Some groups also disagree with its use in enhanced oil recovery, which they say only aids in the continued development of the fossil fuel industry. According to the Global CCS Institute, there are 21 large-scale CCS projects in existence around the world, and they include steel plants, hydrogen production facilities, natural gas processing plants and chemical production plants. Another large-scale clean coal project in the U.S.—the Kemper County energy facility in Mississippi—is slated for completion early this year after extensive delays and cost overruns. Last summer, The New York Times showed that he Kemper coal plant was more than two years behind schedule and more than $4 billion over its initial budget of $2.4 billion. Steve Clemmer, the director of energy research at the Union Of Concerned Scientists recently wrote that "while studies show coal with CCS could play a modest role in addressing climate change by 2050, it’s unlikely to be enough over the next four years to fulfill Trump’s promises to revive the coal industry." Many experts agree that the future of the floundering coal industry in general—regardless of the new administration’s promises—is looking grim. That’s because market forces, rather than federal regulations, have probably had the biggest role in its decline up to this point. Most experts agree that competition from cheap natural gas has been the greatest blow to coal so far, and will likely remain instrumental in its continued decline. In 2016, coal production fell by about 17% from 2015, according to the EIA. Its share of electricity generation currently stands at about 30%—still a hefty percentage, but less than the share of natural gas for the first time ever. In general, the nation is unlikely to see the widespread revival of coal-fired power that the new administration has suggested it will bring about. 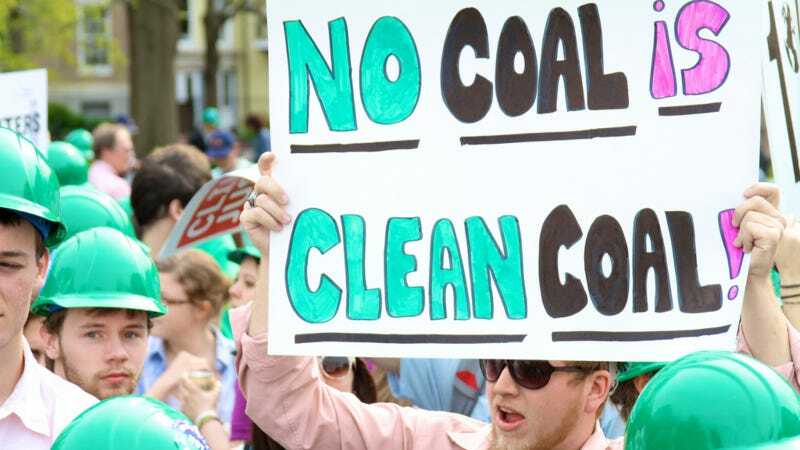 And while that doesn’t preclude existing coal plants from being outfitted with carbon-capturing technology in the meantime, some experts have expressed skepticism about the Trump administration’s commitment to “clean coal” in the first place. In fact, some environmental groups take issue with the concept of clean coal entirely, even when it’s embodied in projects like Petra Nova. Out of all of the fossil fuels, coal contains the highest carbon content. Even if carbon dioxide is being captured via CCS technology—which, for now, is only true at Petra Nova—coal combustion facilities are known to produce a variety of other pollutants, including sulfur dioxide, nitrogen oxides and heavy metals. Additionally, concerns about the impact of coal mining recently led the Interior Department under the Obama administration to finalize a new regulation that would prohibit coal mining companies from engaging in any activities that could permanently pollute streams and other drinking water sources. In the meantime, the U.S. isn’t the only country that’s seeing a decline in the popularity of coal. The government of China—the world’s biggest greenhouse gas emitter—has recently taken a number of steps to reduce the country’s dependence on coal, which still accounts for the biggest share of electricity produced there. Recent reports suggest that coal consumption has remained flat, or even slightly declined, in China since 2013, and the government has also placed a moratorium on any new coal mines for the next three years. Many of the challenges faced by CCS have to do with its status as a fledgling technology. Costs, for instance, remain a major deterrent to its implementation. Jeff Erikson, general manager for the Americas region at the Global CCS Institute, said the technology’s costs should fall as its adoption increases, and that continued research and development will be key to making that happen. But while CCS technology has received substantial investment through the Department of Energy, other experts have suggested that a lack of policy incentives may be the biggest hurdle for the technology’s expansion. Without stringent emissions regulations to provide an incentive for power plants and other industries to implement the technology—especially as the Clean Power Plan remains in legal limbo—there may simply not be enough of a market at the moment for the technology to really gain steam. The Obama Administration invested about $4.8 billion in CCS to get to this point. That said, some experts have argued that the global community is unlikely to meet its climate goals without the technology, especially while fossil fuel energy remains in use. And Erikson noted that the energy sector isn’t the only area where the technology can be applied. It can also be used in other industrial applications—hydrogen production facilities or fertilizer production plants, for instance—to cut down on their carbon dioxide emissions as well. Erikson also notes that the development of CCS technology is not mutually exclusive with the expansion of renewables like wind and solar—rather, they can all be deployed together as common strategies for tackling climate change. Whether this argument will resonate with the new administration is uncertain—President Trump has famously vowed to dismantle many of the climate policies and priorities established under the Obama administration. But there’s still a business case to be made to the Trump administration for the promotion of CCS technology—and not just clean coal, but all its forms, suggested George Peridas, a senior scientist with the Natural Resources Defense Council.